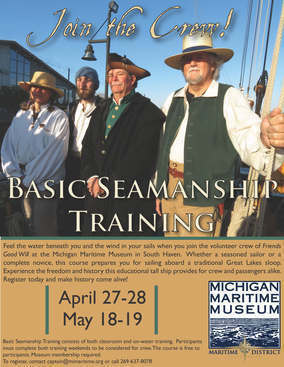 Basic I: This is a basic introduction where students will learn the history of the Michigan Maritime Museum, the history of the original and the new Friends Good Will, and the organization and the policies of the Ship's Company. Basic II: Students will be introduced to the ship, learning names of various parts of the vessel and her rigging, safety procedures, safety drills, and some basic marlinspike skills of knots, belaying, and handling mooring lines. This class will be held in part aboard the Friends Good Will at the dock. Basic III: Students undergo a full ship's safety orientation. Basic IV: Students will get underway aboard the Friends Good Will and go sailing. Students will practice sail handling skills, safety drills, and maneuvering the vessel. Multiple setting and striking of the sails and multiple drills will give everyone a chance to participate. There is no cost for these classes, but a Museum membership is required. Memberships may be purchased online at our website, over the phone, by mail, or in person. To enroll in the classes, first purchase a membership and then contact the Captain by phone at 269-637-8078 or email captain@mimaritime.org. Successful completion of the Basic Seamanship courses or equivalent is a prerequisite for serving as crew aboard Friends Good Will. In addition to the courses, prospective crew must provide period-appropriate clothing and enroll in a drug testing pool at their expense. The details of these requirements will be discussed in class. First aid and CPR training is highly recommended. The minimum age for volunteer crew is 16.